I very much want to live and I hope there is medicine for my condition out there. I’m not scared of death but my parents have suffered a lot,’ he said. Two years later when their son Iqramul was born,and showed the same symptoms, the family went back to the doctor. But again, they were not offered any tests or possible diagnosis. Nabi, who works as a gatekeeper at a factory earning 2,000 rupees – or £20 – a month said: ‘We never heard of the word Progeria, the doctors never mentioned it. They were stabbing in the dark; they were as clueless as us. Nabi and Razia carried on having children hoping they would conceive a healthy boy or girl eventually. Their wish was granted when they had Sanjeeda. In 1995, after years visiting different doctors, a consultant in Kolkata finally diagnosed four of their children with Progeria and broke the devastating news that there was no cure for ay of them. ‘The diagnosis didn’t help,’ Nabi added. ‘People were sure there was a cure. No one in our community believed there was nothing that could be done. 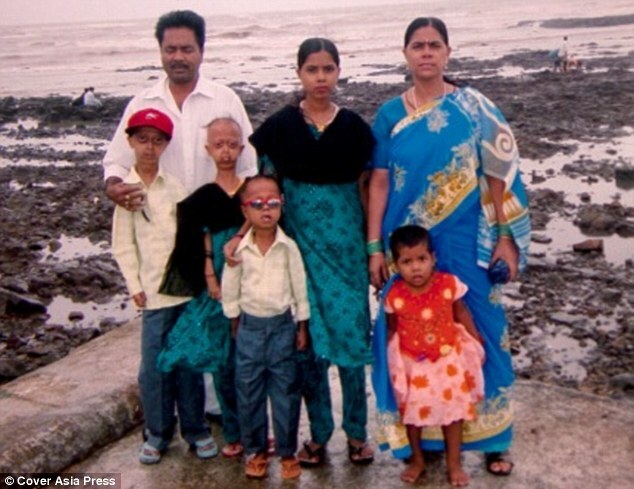 Life was made unbearable for the five children growing up with Progeria and they were mocked in school and called names like ‘big-eyed boy’ and ‘Patlu’ meaning skinny. Eventually they all stopped going to school. Ali, who weighs just 1st 8lbs, said: ‘None of us have had a childhood, we were confined to our homes. ‘We had each other but that was it. We had no life. When we did go to school we were pushed and shoved, called names, kids tried to harm us. We can’t do much physically either; our lungs are so small we get breathless easily. 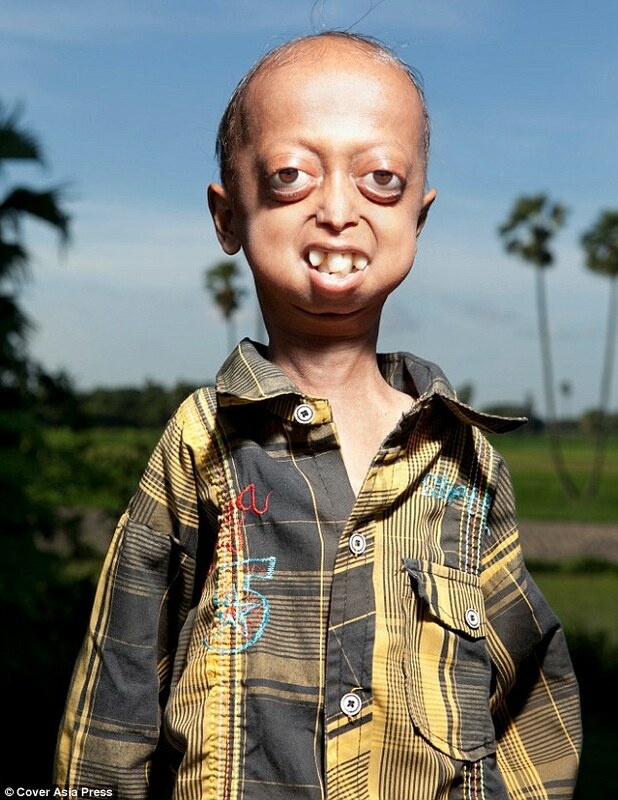 Ali is now the family’s only surviving Progeria sufferer. When his brother Ikramul died four years ago he was devastated. ‘Iqramul was my best friend,’ he said. ‘I was very young when my other siblings died, so it were just Ikramul and I for a long time. 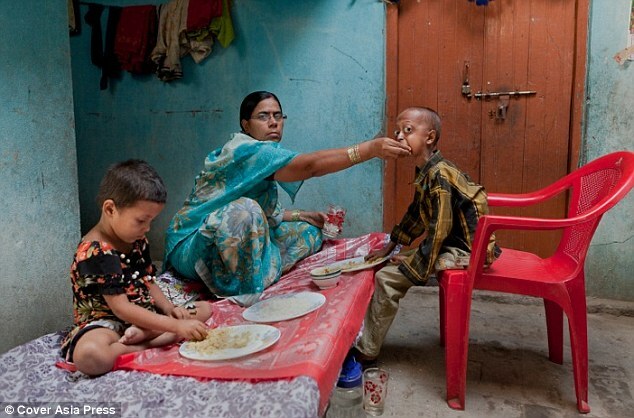 Ali and his parents are now supported by a Kolkata-based charity called SB Devi Charity. 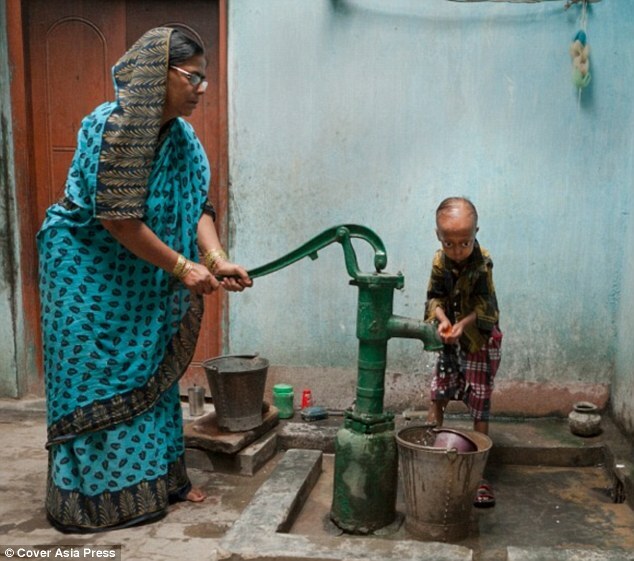 Pediatrician Dr Chandan Chattopadhyay, from Kolkata, introduced the family to the organisation and now they help Ali pay for his medical needs. Ali spends all of his time with his mother and sisters, Sanjeeda, 20 and Chanda, ten, and he believes there’s no one else like him in the world. But when told about the famous annual Progeria Reunion, run by the Sunshine Foundation, he would love to attend. ‘It’s very lonely living this life, especially since my siblings have gone,’ he added.